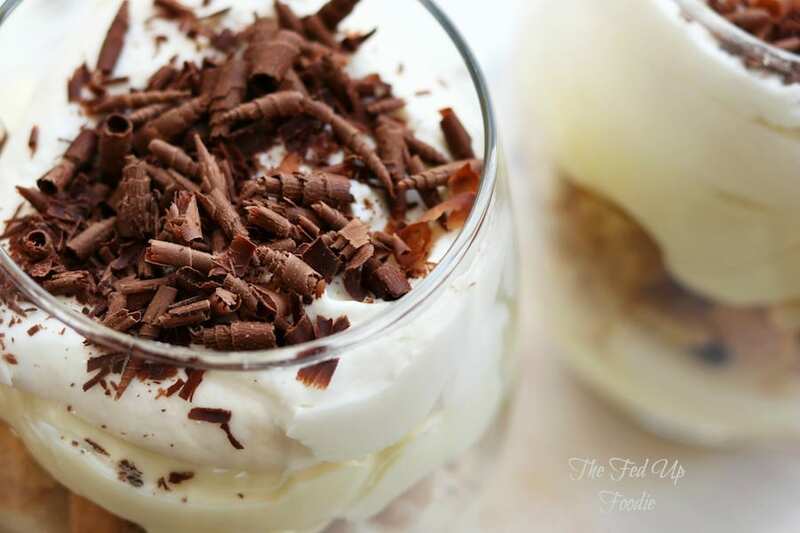 Perfect for dinner parties, Tiramisu Wine Glass Trifles are a twist on the classic Tiramisu. Rich, creamy and elegantly portioned. 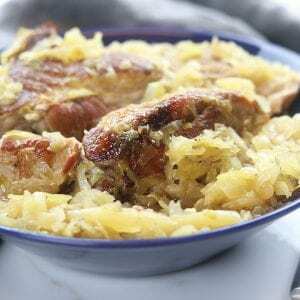 This will be the star of your dinner. Is there anything better than Tiramisu? In one bite there is coffee, liquor, custard, cream and chocolate. Talk about dessert paradise! 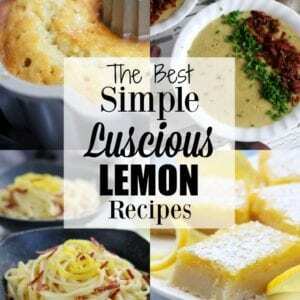 I will admit, I have had my fill of sweet treats getting recipes ready for the Holiday season. I am definitely ready for the healthiness of January to start, but not before diving into one of my favorite classics first. Once I saw organic lady fingers at my local Sprouts, I knew this was in my future. 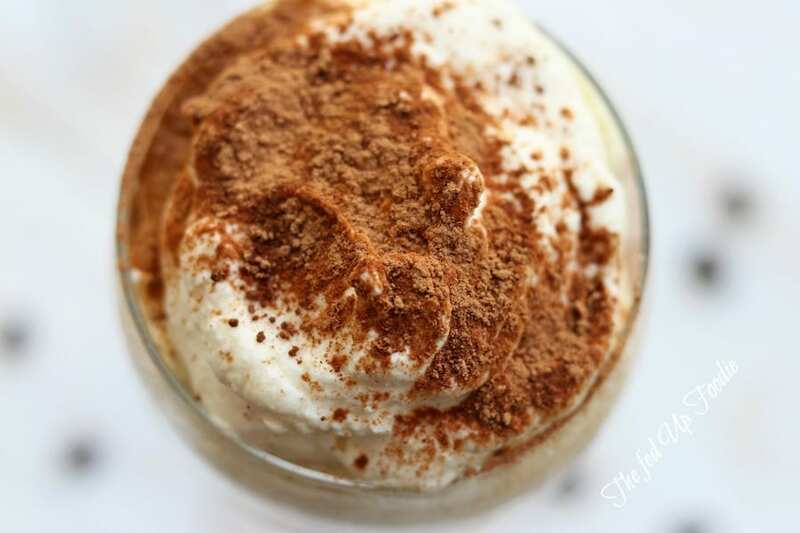 What is so perfect about these Tiramisu Wine Glass Trifles, they are perfect for making ahead of a dinner party with virtually no serving and they look incredibly elegant. I also love that these would be just as incredible at a summer get together as they would a winter one. 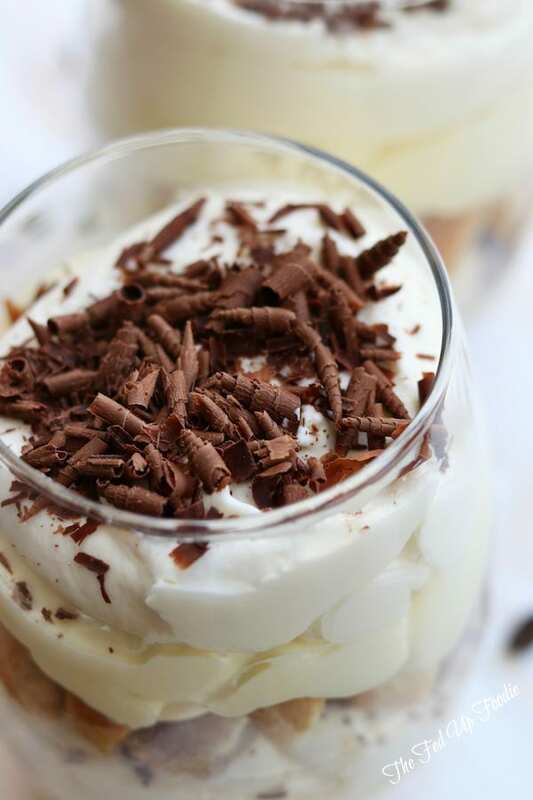 I also say, why not make these beautiful Tiramisu Wine Glass Trifles just because. They will make you feel so incredibly fancy. 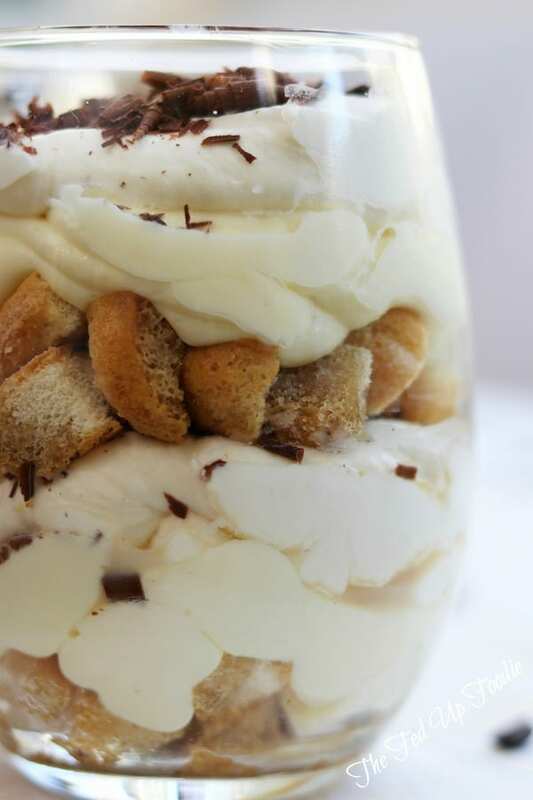 Cut your lady fingers into small chunks for these Tiramisu Wine Glass Trifles. I first cut the lady fingers down the length of the cookie and then into about 8-10 bite size pieces. Use your favorite style of wine glass. One important thing to keep in mind is depending on the size and style of your glass, your servings will vary. Tall stemmed wine glasses yield 6-8 servings. Shorter wine glasses yield about 4 servings. If possible, use expresso for the coffee/liquor mixture. Very strong coffee can be used in a pinch but it just doesn’t have the depth of flavor that expresso does. If you can not find Mascarpone cheese (which is not uncommon in many stores across the US) mix together 12 oz cream cheese, 1/4 sour cream and 1/4 heavy whipping cream until smooth. It won’t be exactly like Mascarpone but if you don’t tell anyone, chances are they will never notice. Layer, layer, layer. Start by adding the lady finger chunks to the bottom of the glasses and drizzle with about 2 tbsp of the espresso/liquor mixture. Once you have added the espresso/liquor mixture to each of the glasses, check for dryness of the lady fingers. If they are too dry add another 1-2 tbsp until the chunks are saturated. Then layer in custard and whipped cream. Repeat but make sure the top layer is whipped cream. The easiest way to transfer the custard and whipped cream to the glasses is with a disposable pastry bag. Here is a secret, if you do not want to invest in pastry bags, use gallon sized Ziplock bags instead. Place the open bag into a large glass, wrap the edges of the bag around the rim of the glass and then spoon in custard. Move custard to one corner of bag. Twist excess plastic of the bag for gripping. Cut about 1/4- 1/2 inch of the tip of the bag off. Voilà, you have a make-shift pastry bag. On top of your whipped cream sprinkle either shaved chocolate or dust with cocoa powder. Either one looks gorgeous. 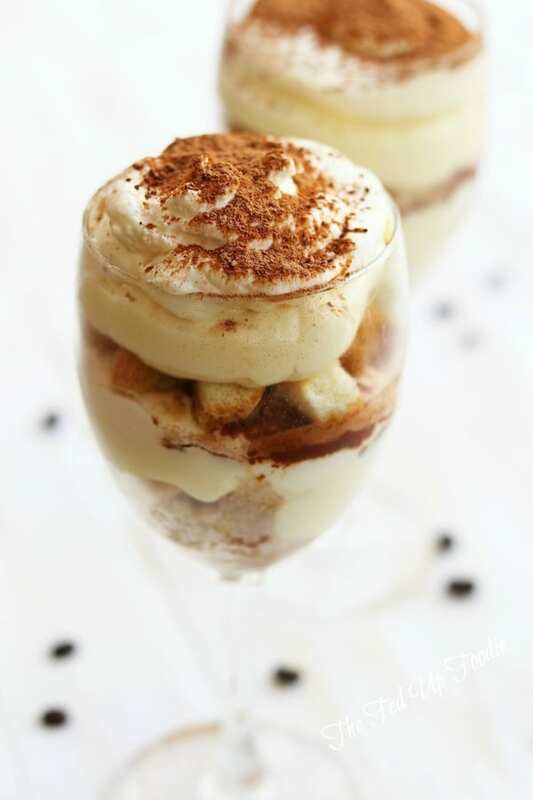 These Tiramisu Wine Glass Trifles keep beautifully in the refrigerator for up to 2 days. A variation on the heavenly Italian dessert. Prepare custard first by heating milk in a medium saucepan over medium heat to almost boiling (do not boil). Meanwhile whisk together egg yolks, sugar, cornstarch and salt in a medium stainless steel or glass bowl. Slowly stream in 1/2 of hot milk to yolk mixture while whisking consistently. Add remaining hot milk, continue whisking. Transfer back to saucepan. Cook over medium low heat, whisking constantly until mixture thickens-about 5-7 mins. Transfer to a clean bowl and stir in butter and vanilla. Cover with wax paper and chill for an hour. Make coffee and let cool to room temperature. For the whipped cream layer combine whipping cream, sugar and vanilla in a mixing bowl. Beat until stiff peaks form- about 1 min. Transfer to a pastry bag & refrigerate. See tips in post above for pastry bag replacement. Once the custard layer is chilled, whip together with Mascarpone cheese and place into pastry bag. Cut lady fingers into chunks- about 8 chunks per cookie. Set aside. Mix together room temperature coffee and amaretto. Line up wine glasses and place desired amount of lady fingers in each glass as the bottom layer. Spoon 1-3 tbsp of coffee/liquor mixture over cookie chunks in each of the glasses until well saturated. Squeeze in a layer of custard and then a layer of whipped cream. Repeat with cookie, custard, whipped cream. Garnish with shaved chocolate or dust with cocoa powder. Refrigerate until served. *Please use as many organic ingredients as possible. * Preparation time does not include chilling time. 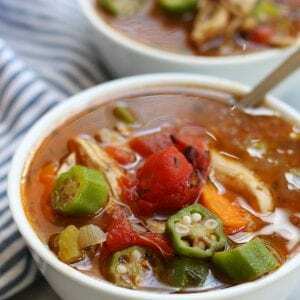 Adapted from Epicurious, All Recipes and FOOD.com. I love tiramisu also. Very Christmas to you also!!! I hope you and your family have a very blessed day! How fun are these! I love tiramisu, and the presentation in wine glasses is stunning. 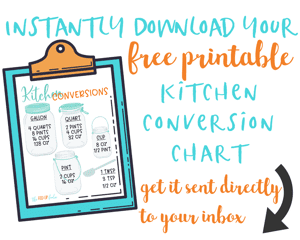 Perfect for a dinner party! Thank you! They were as much fun to make as they were to eat. How fun. I love a single-serve parfait, especially when they’re tiramisu! Thank you Renee! Me too!! 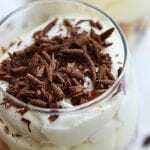 I adore tiramisu so your parfaits are calling my name!!! Thank you Liz. Tiramisu definitely ranks up there as one of the best desserts for me too. These are gorgeous! I love that they are done in wine glasses!